Electric Train Systems (ETS) was founded in 1990 by Gustav Tauš and Ludvik Losos to manufacture a range of 1:45 'O' gauge models in all metal, stamped sheet construction, with additional metal castings included for detail, and lithography for added small details. The factory in Prague, the Czech Republic started out making trains in small batches of about 150 to 250 each for locomotives and 300 to 2,000 for cars. The small firm started with about ten employees. ETS trains are made primarily from sheet steel. The ETS Elektricka Zeleznice equipment is similar to classic Märklin 'O' gauge trains made during the 1930's, with glistening lithography on rolling stock and with built-up rather than cast-on detail on the locomotives. Elektricka Zeleznice is Czech for 'Electric Train.' ETS locos and rolling stock are hand assembled from the embossed tinplate and die-cast parts using nuts and bolts. The cars feature lithography and/or tampo printing. In addition to making its own line, ETS has done contract manufacturing, for the British firms Ace, Bassett-Lowke, Modelfair, and Scale Link. The rugged MAXI gauge 1 system was initially produced for Märklin by ETS. For many years starting in 2007 ETS worked with Weaver, who exclusively distributed the ETS product line in America. The very first locomotive produced was an 0-4-0 E225 electric outline model closely representing a Czech original prototype, which had a litho finish. It remained in the ETS catalogue for many years. A lithographed T234 series 0-4-0 diesel came next, but is no longer available. ETS sets came packaged in unique hand crafted wooden boxes with a sliding cover adorned with colorfully illustrated paper labels depicting the trains. The sturdy boxes contained separated interior compartments to house each item. Sets were complete with loco, 3 freight cars, curved and straight track, transformer, and instructions. Some sets even included overhead catenary systems and switch tracks. Initially designed for two rail operation, ETS developed and offered a special adapter to convert their locos to run on 3-rail track. 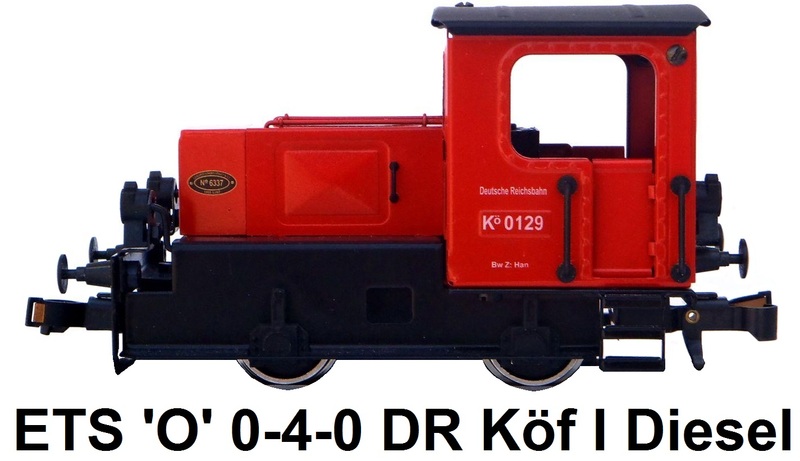 ETS's 0-4-0 diesel locomotive was available inscribed as a DR Köf I model or a CSD series T220.3. It was available in red or black. 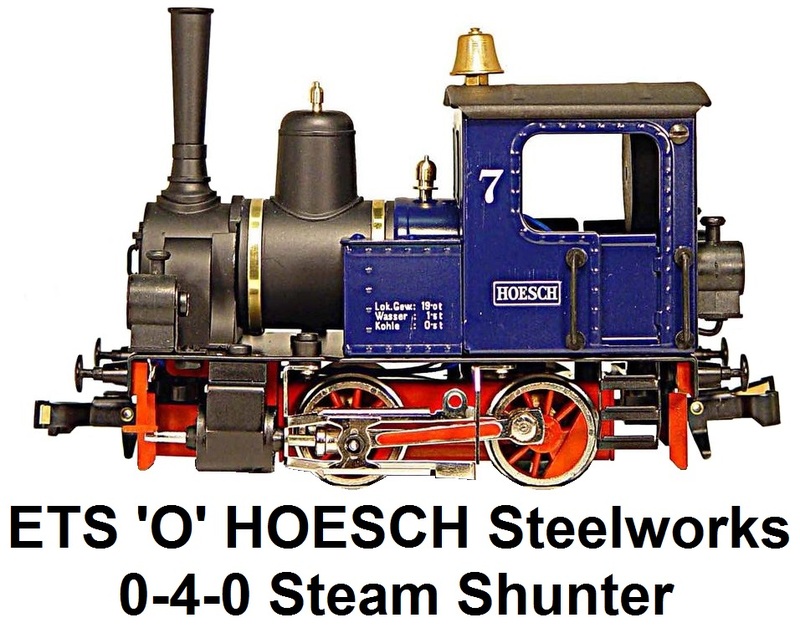 A small 0-4-0T steam locomotive came next, available with steam sound and remote whistle. This 220 series loco and the 0-4-0 electric were also available in color schemes for the DR, CSD (Ceskoslovenske Stami Drahy the Czech State Railways), and KKStB (the Koniglich-Kaiserlich Staatbahnen). In 2003 a model of a German class 24 2-6-0 steamer with large Wagner smoke deflectors and a 6-wheel tender was produced followed by a handsome 2-8-2 tank locomotive for the Czech railroads. ETS issued a total of 4 different freight cars in 1991 but by 2009 the catalog listed over 100 freights. In keeping with the reputation of the Czech Republic for making the world’s finest beers, ETS put together a wide variety of lithographed 8-wheel and 4-wheel tinplate beer cars. A 3-car beer train set of these cars was offered pulled by an 0-6-0 loco. 4-wheel beer tanker cars were also produced. 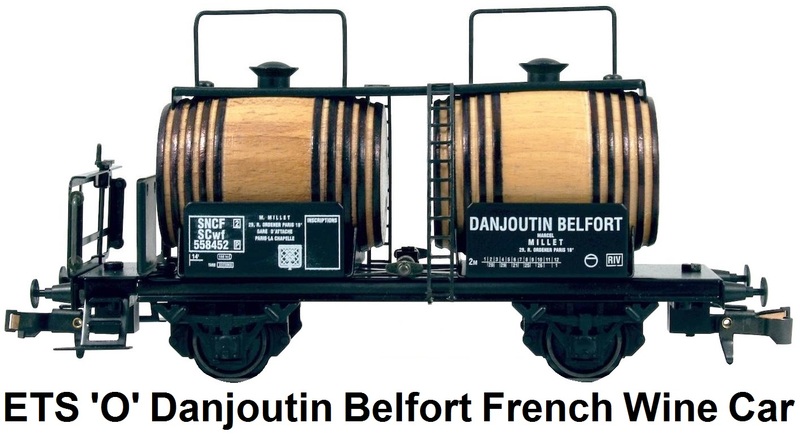 Freight car designs included 4-wheel box cars, the 8-wheel boxcars (also in DR and CSD liveries), tanker cars, wine barrel cars, covered goods wagons, high side gondolas, reefers, a hopper car and a caboose. ETS also developed 'O' gauge 4-wheel and 8-wheel tinplate passenger coaches and a baggage car. ETS passenger wagons were originally modeled on 2-axle CSD coaches used in local passenger service. Then in 2005 ETS introduced 4-axle wagons, 41 cm (16") in length, based on passenger coaches found on the German, Swiss, Austrian, and French railways including MITROPA sleeping and dining coaches. 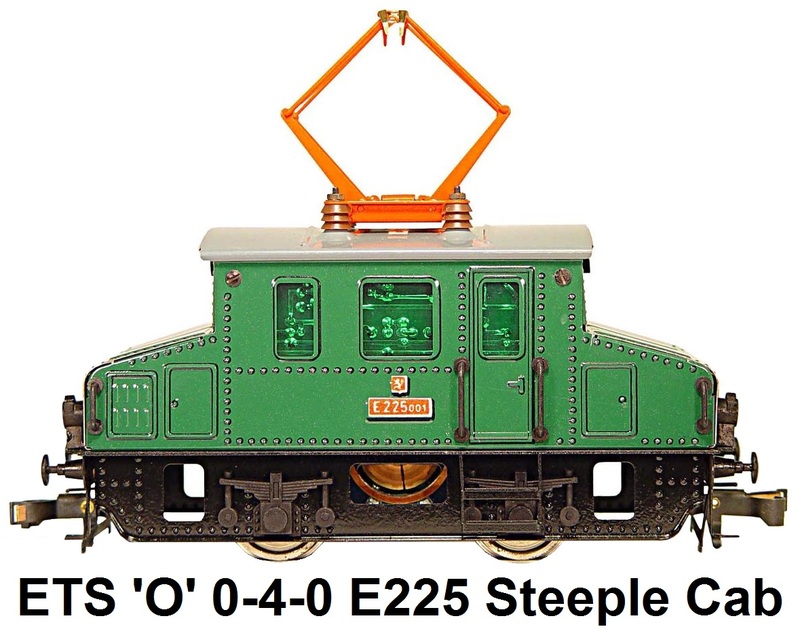 ETS equipment intermixed well with trains from other 'O' gauge manufacturers. Wheels were available with both high-rail and scale flanges. And in addition to its own couplers, ETS supplied modern replicas of the historic Märklin German Fix couplings, U.S. style knuckle couplers, and British Hornby drop link couplings. One exceptional ETS product was the model of the Swiss Crocodile locomotive. The Swiss Crocodile electric outline loco is among the most famous prototype electrics in the world. 2 versions of the Crocodile were produced by ETS. One was the shorter Seetal Swiss type De6/6 introduced in 2001. The other was the longer Gotthard Swiss type Be 6/8 III released in 2002. ETS equipment is available in a variety of versions for two or three-rail and either AC or DC operation. Locomotives are equipped with five-pole electric can motors. Torque is transmitted to the driving wheels via worm gears coupled with a patented automatic clutch that disconnects the motor from the drive train when track power is cut. This enables the locomotives to coast freely or be pushed by hand. ETS configures its articulated engines such as the Crocodile with two separate motor drives. The imposing Beyer-Garratt that ETS released towards the end of 2003 is one of the firm's more elaborate steam outline locomotives. While it may appear strange to American eyes, this loco's prototype gained popularity in various African countries such as South Africa and Zimbabwe, as well as in Australia and South America. H. W. Garratt came up with a patented design for an articulated locomotive with a water tank up front, a boiler in the middle, and a coal bunker and smaller water tank out back, all riding on two widely spaced sets of drive wheels. This design leaves plenty of space for a wide-girth boiler and a deep firebox, important considerations when constructing a locomotive. The Garratt is also more agile than a conventional articulated locomotive, since there are two pivot points instead of one. Its unique design enabled it to negotiate tight track formations. Also, it has almost no overhang on curves. The ETS Garratt model is a 2-6-0+0-6-2 configuration like its narrow-gauge prototype. It was available in three different liveries lettered for the London Midland and Scottish Railway (LMS) in England, available in black for the South African Railways, and in Ferrocarril Entre Rios (FCER) green livery for the Entre Rios Railway of Argentina. Measuring 20 inches in length, the ETS Garratt easily handles 27" radius curves. Specifically for the American Market, in 2001 ETS made an articulated free-lance Mallet logging Engine in maroon labeled for the Sequoia Lumber Co. in both an 0-4-4-0 and 2-4-4-0 configuration. It was sold in sets with 2 log cars and a caboose. The action of the side rods in motion when the train was running appeared very realistic. Just as the prototype it was modelled after, the loco featured a fixed rear motor truck and a swiveling front unit. It came with an actual miniature wood pile in the bunker. 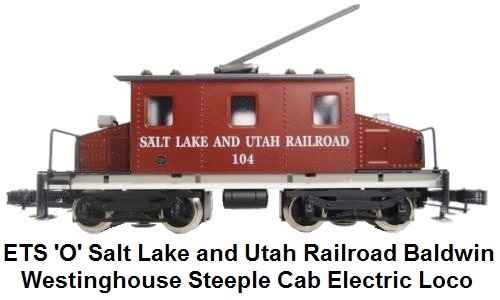 In 2005 ETS introduced its Salt Lake and Utah Railroad Baldwin-Westinghouse BW Steeple Cab Electric Loco 211 B. It featured dual motors and was available in several lesser known paint schemes. 2005 also saw the release of the ETS 2-8-0 Austerity Steam Locomotive and tender. Modelled after the prototypes built in the United States as part of the post-war restoration plan, the Austerity engines were produced and adapted to suit various situations in war-torn Europe. They were a blend of British and American practice and the first examples worked on the Great Western Railway of Britain. 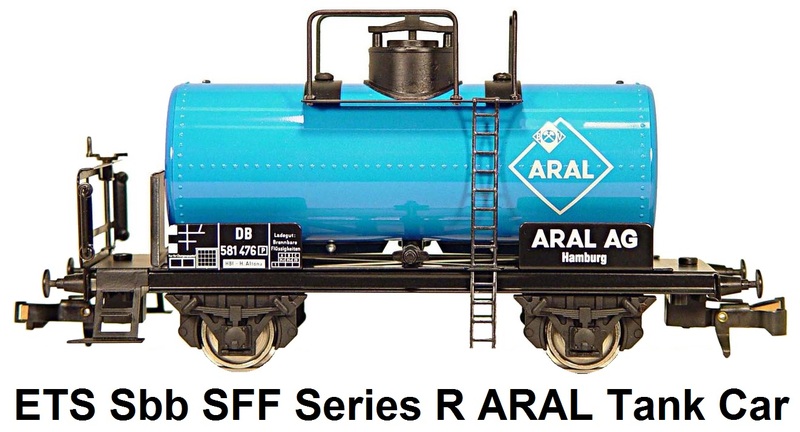 2 paint schemes were issued by ETS. One was a green painted version for the Longmoor Military Railway, and one was the black painted Liberation Loco UNRRA for the Czech railways. In 2008 ETS introduced their 0-4-0 Glaskasten (Glass Box) steam locomotive. This was one of their smallest yet probably one of their most detailed locomotives featuring an intricate running gear. An unusual motorized item from ETS was a 1:45 scale 1970's era Volkswagen bus track inspection car. The success of this motorized unit led to the production of a Volkswagen Beetle track inspection car also of tinplate construction. There were also pick-up truck motorized track inspection cars issued. ETS made track in two metric sizes, roughly equivalent to O-27 and O-54 tinplate tubular track. The smaller ETS trains are intended to be run on the O-27 tracks while the larger articulated engines, the Garratt's, the 8-driver steamers and the Crocodiles are intended to be run on the O-54 track. ETS also produced a special set of motorized and dummy Trams and 2 rail tramway track. ETS catalogs are issued in English, German and Czech. Gustav Tauš served as managing director of Electric Train Systems for almost 25 years until his passing in April of 2015. Jiři Němeček served as the ETS design engineer. ETS continued manufacturing under the ownership of Mr. Tauš's wife Barbara. Click this link to access the ETS website.